Marie-Luise Frey is an artist who makes liturgical weavings in one of the four Lutheran parament workshops in Germany. To celebrate the 120th anniversary of the workshop of the Elisabethenstift in Darmstadt, where she is active, she has created an original liturgical parament. Paraments are liturgical textile works that in the Catholic, Lutheran and Anglican traditions ornament the front of altars, pulpits, lecterns and chairs. 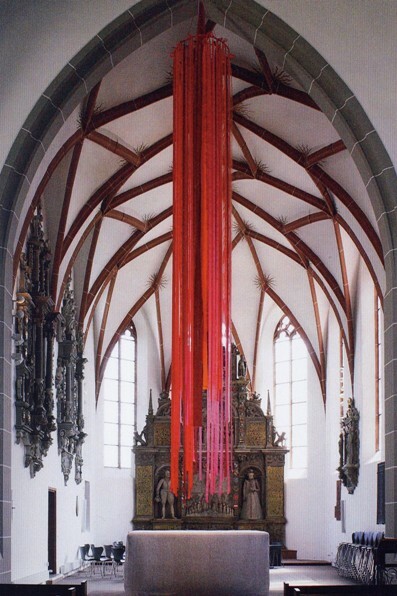 Marie-Luise Frey’s work for the church in the city centre of Darmstadt consisted of six installations made of wool and fabric strips of six different colours in line with the colours of the Christian calendar. They contained no representation, no Christian symbols, but were rather made up of colours and materials wanting to comply with the Christian liturgy. In various Christian traditions the liturgical seasons are visually identified by different colours. In the installation for Pentecost a multitude of red ribbons descend from the church keystone towards the altar. It is a visual equivalent of the descent of the Holy Spirit on the believers, who had gathered in one place (Acts 2:1-13). The biblical text also translates this experience in visual form by telling us about tongues of fire that descended on each person (Acts 2:3). In the installation for Ordinary Time the artist has used strands of wool in five different greens, with which she has wrapped the altar (in the manner of Christo). Green is the colour of vegetation. This installation thus also is a hymn to nature and creation. The artist invites us to make a connection between the Lord’s Supper, which is made up of the fruits of nature (wheat and grapes), and the attention we give to nature, which is given to us by God not to exploit it, but to admire and protect it. Outside the church tower is illuminated by lights in the colour of the liturgical season and the corresponding artistic creation. It is a way to invite those who pass by to come and see the installations and perhaps in this way discover some of the richness of the Christian liturgy. Marie-Luise Frey: Six Colours Project, 6 liturgical installations, Darmstadt, City Church (Stadtkirche), 2012. Marie-Luise Frey studied textile arts and design. Since 1989 she has worked in the textile workshop in the Elisabethenstift in Darmstadt, Germany, that makes textile works and installations for churches. See http://www.textil-kunst-kirche.de.